Gerardo Martinez Narro envisions a future where the sun, the wind and the earth provide all the energy we need for vibrant economies with minimal harm placed on the environment we depend on. His research with Professor David Ting in the Turbulence and Energy Laboratory at the University of Windsor, Ontario through Mitacs Globalink Research Internships is just one piece of the sustainable-earth picture that Gerardo is helping to paint. As a student from Instituto de Estudios Superiores de Tamaulipas, Mexico, Gerardo is enjoying the research culture in Canada where the standard of excellence is high, and he receives detailed guidance from the lab team and his professor when he needs it. 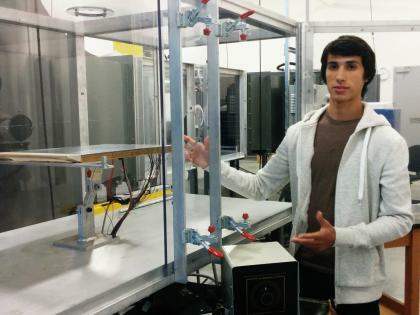 His project involves testing the heat efficiency of a new type of solar panel to optimize its power generation ability.